I was tired yesterday and didn’t have the strength to resist the pull of the library when I drove past (maybe not EXACTLY past, but it was a strong pull). So this is the result. 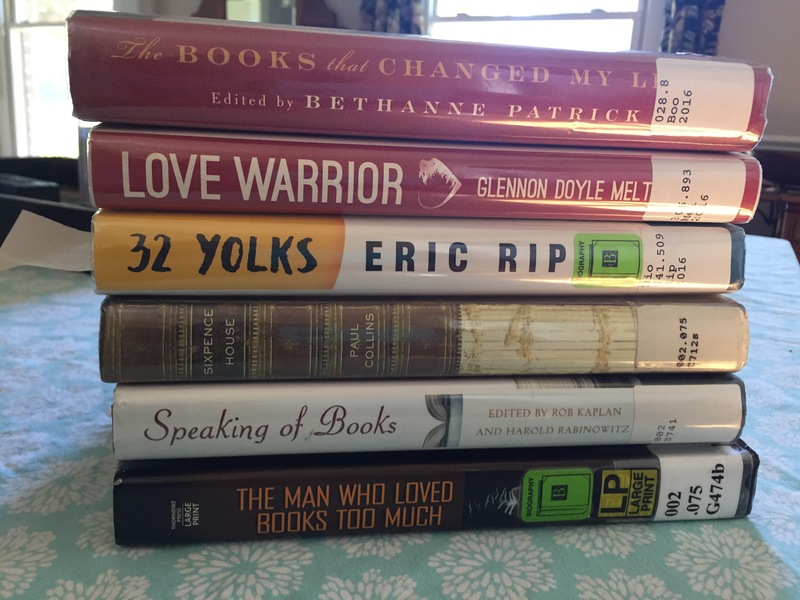 The Books that Changed My Life (Bethany Patrick), Love Warrior (Glennon Doyle Melton), 32 Yolks (Eric Ripert), Sixpence House (Paul Collins), Speaking of Books (Rob Kaplan and Harold Rabinowitz), and The Man Who Loved Books Too Much (Allison Hoover Bartlett). I am sensing a books-about-books theme here. From time to time I am asked what my favorite book is and I tend to answer (drum roll) Rebecca, by Daphne du Maurier. I love the characters, the setting, and the gothic plot, and I read it almost every year. Recently I listened to it on a long car trip and still had a few chapters to go when I got home so I found my copy and finished it before I even unpacked. I may have taken my coat off first, but I couldn’t swear to it. I love Mrs. de Winter, who famously is never identified by her first name. (I can relate to that, having often been referred to as Betsey’s sister or Frank’s wife.) Her anonymity helps us slip into her skin as her voice tells her story. She seems initially almost characterless, with mousy hair (how unkind), social awkwardness and lack of resistance to being bullied by the woman she serves as paid companion. When she is swept off her feet by the glamorous Maxim, we thrill vicariously to her Cinderella story. As she settles in to life as the second Mrs. de Winter she seems not even to think of herself as an individual with a name, but as a cog in the machinery of Manderley. We gradually sense that things are not as they should be for Mrs. de Winter, as she attempts to settle into a home and life where she does not seem welcome. This brings us to the evil Mrs. Danvers, one of the great literary villains of the 20th century. I love to hate her. This story is a mystery, but so beautifully written I love reading it again and again, in spite of knowing how things are going to turn out. I first discovered Rebecca by seeing the 1979 version with Jeremy Brett, which is (fanfare! cymbals!) finally available on dvd. The Hitchcock version is wonderful too, perfectly expressing the innocence of our heroine and the growing horror as things spiral out of control for her. I am not a fan of the Diana Rigg version. Read it. Read it again if you already have. It is that good. Welcome to the inside of my head. Having journaled my books for years just for my own pleasure, I thought if I dipped my toe into the wordpress community I might meet other book-obsessed souls like myself. I grew up reading sci fi since that was what was in the house and did not branch out to other genres until after I was married. In my husband’s record collection was Wuthering Heights on a Kate Bush album-‘ Heathcliffe, it’s me, it’s Kathy’ was so compelling I had to read the book to find out what the deal was. Huge epiphany- there is a reason the classics are considered classic- they’re good books! Seems obvious, but I was late to that party. Brit Lit is my favorite but now I love lots of things- literary fiction, memoir, popular science, self help. spiritual. I have other loves in my life but books trump them all except family.